In the approach to the final quarter of the year, all eyes will turn towards forecasting year-end financials. Depending on the company’s corporate debt levels, year-end covenant forecasting might be a particular point of focus. By the end of Q3, senior management including CFOs, financial controllers, and treasurers will have a will have a good handle on the income and expense side of the business. Of course for cyclical businesses, whose busiest time may fall in the last quarter of the year, such as retailers in the run up to Christmas, this isn’t true. For them the year can be won or lost in the last month. However, for most businesses, forecasting full year profit and loss should be reasonably straightforward coming into the final quarter. Forecasting balance sheet numbers into year end can be a far more challenging task as they are a snapshot at a point in time. As a result, they are subject to more volatility as the key date approaches. Balance sheet forecasting is an important task in its own right, but becomes doubly important when key components feed external debt covenant calculations. Banks and other lenders use covenants as a key measure of risk and closely monitor the covenants of the companies they have lent to, on an ongoing basis. Lenders aren’t the only market participants interested in corporate covenants. Rating agencies such as S&P and Moody’s very closely monitor covenant levels for breaches, which in some cases trigger defaults, but also show deterioration which can lead to credit downgrades for rated businesses. Due to the impact a covenant breach can have on a company, they are also very closely watched by equity markets and anyone who owns shares in a highly leveraged business. As mentioned, a covenant breach can trigger a default which, in many cases, hands control of a business over to its lenders, wiping out most or all equity. While this is a worst-case scenario, based on the currently elevated levels of corporate debt, a movement upwards in interest rates above expected levels or tightening credit conditions could lead to a sharp increase in covenant breaches and defaults. 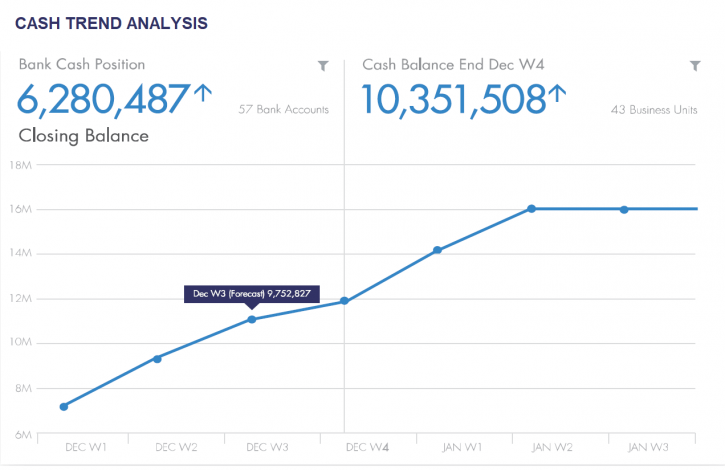 The difficulty in accurately forecasting certain balance sheet numbers, such as a year end cash. In a large organisation, unless they are using dedicated cash forecasting software, it’s unlikely that the person or team forecasting the future covenants will have all of the required information readily available. For example, looking at two of the most common debt covenants, the leverage ratio (Net Debt/ EBITDA) and the interest covenant ratio (EBITDA/ Interest Expense) we can quickly see the number of inputs that are required and where they need to be sourced from. The process is further complicated by the need to sometimes capture forecast and actual data from different people and teams. The table below outlines the required inputs to these covenants and their sources. Of course, this tables ignores the many people who are involved in creating these headline numbers, which in large companies is a lot of people. It also ignores any adjustments that need to be made to the figures before inclusion in the covenant calculation. For example, an adjusted measure of EBITDA is often defined by a bank for use in the calculation, which removes some business activity if it distorts the true underlying measure of cash generation. When these factors are considered, the task of covenant forecasting becomes increasingly challenging. Open up lines of communication as early as possible with everyone on whom there is a data dependency. Clearly communicate to everyone involved in the process the importance of the numbers and what they ultimately feed into – debt covenants for external lenders. Prepare everyone for more frequent data refreshes as year end approaches. For the couple of weeks before year end, a daily refresh (at minimum) is likely. Try to build an understanding of other data and process dependencies and use these to manage expectations accordingly. Ideally, covenant forecasting should be part of weekly or monthly management reporting. If this is the case, the impact of the year end process should be lower and lines of communication already open. The year end cash number will be the biggest variable in the covenant calculation. In the final month before year-end, earnings and debt numbers should be reasonably under control. Cash, on the other hand, can be hard to pin down until the last moment. This is because there are so many inputs into the overall cash figure. 1: What are cash levels right now? The best place to start is to confirm the exact cash number as it stands now. A large, multinational organisation will have a vast number of accounts spread across the globe. The only way to be able to achieve a consolidated view of the overall “live” cash figure is with specialised bank and liquidity reporting software. This will enable a view that includes all banking data in one place, pulled automatically from a multitude of sources (including MT940 or BAI2 files). Because of the number of business units (subsidiaries, global network companies, other departments, etc.) and number of people that are needed to produce data for accurate covenant forecasting, executive sponsorship is key. If senior management issue a communication to all relevant personnel outlining the reasons they are being asked to contribute data to the process, they are far more likely to produce high-quality data within the stated deadlines. Understanding how cash is currently trending can help build a picture of where it is likely to arrive at year-end. This means comparing and measuring movements, rather than just looking at snapshots in time. How cash has trended historically can also help to complete this picture. While past cash movements aren’t necessarily indicative of future positions, if cyclical trends are identified they can help increase the accuracy of year-end forecasts. The most effective way to identify trends in cash movements is with specialised analytics software tools. As a specialised liquidity forecasting and analytics software, CashAnalytics are dedicated to helping large, multinational organisations better understand the current and future cash and liquidity positions. To see how this would work for your company, contact us now to arrange a demo.